In the depths of winter one craves color, and trains can be colorful, and distinctive in their color schemes. Here are two favorite photos. 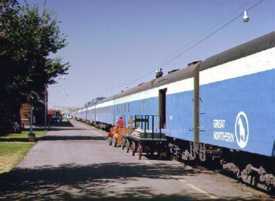 The one on the left is of Great Northern's Empire Builder, taken in Havre, Montana, in 1967, shortly after the railroad overhauled its color scheme, introducing 'Big Sky Blue' and a modern logo. 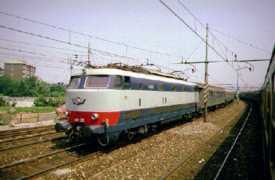 On the right is a regional Italian express, filmed near Milan in 1983. 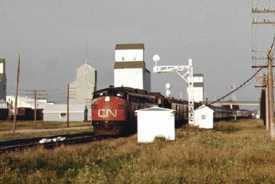 It's the summer of 1969 in Portage la Prairie, Manitoba, and I was able to capture Canadian National's Panorama, one of its two transcons, coming and going at high speed. Though the Panorama, a summer only train is, like its counterpart, the Super Continental, long gone, Portage la Prairie is still on VIA Rail map, visited three times weekly by the Canadian. It's 'coming and going' photos like these that make want want to ride trains, not take pictures of them! 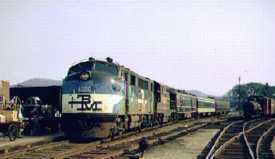 In the mid-1960s the Boston and Maine hosted two intercity trains on its Connecticut River line. 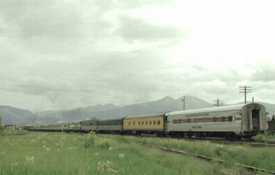 The Montrealer, from Montreal to Washington, via CN/Central Vermont rails between Montreal and White River Junction, B&M from there to Springfield, New Haven to New York, and Pennsylvania to Washington, was an overnighter with sleepers, lounge and coaches that, through several incarnations and reroutings, has survived to this day. 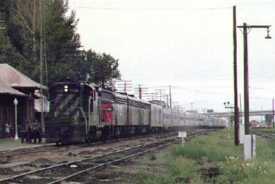 The Ambassador was a coaches only day train between Montreal and New York. Here are two shots of it in B&M livery. 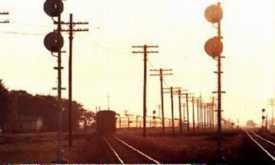 The photo on the left was taken in the White River Junction station in 1964. 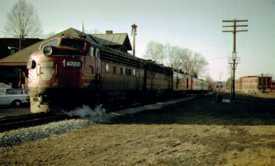 The one on the right shows the Ambassador passing through Windsor, Vt. at speed in 1965. Quite a contrast in engine decor! Though Amtrak has, with the support of Vermont, restored long-defunct day service to Rutland on the other side of the state, the populous White River Junction-Hanover, NH, area served by the Ambassador has but the overnight Montrealer.